We all know workplace diversity makes sense: so why is change so slow? "A more effective way to make workplaces more inclusive is to make people feel and see inequality." It's something we hear all the time: it makes good business sense for companies to be more inclusive. Diverse firms are more representative of customers, inclusive leadership and team culture guards against the risk of "group conformity", and when an organization can draw on a wider pool of candidates, and mitigate unconscious bias in the process, they ensure they're hiring the best. It's even good for the bottom line: time after time, research shows that diversity boosts a company’s profit, growth and even creativity. But while we might rationally understand the value in this – both economic and moral – many organizations still struggle to create inclusive workplace cultures, at least at the pace we need. The barriers are often hidden, as are the solutions. Why is this and what can we do about it? People in general are biased and see reality in the shape of their own homogenous environment, making us blind to inequality. Research confirms this: we are unable to see economic inequality, largely in part because of our environment and a tendency to cluster socially with people who are similar to us in terms of income, status or education, for example. According to this research, it is not that privileged people don't want to deal with inequality: they are not able to see it. When we extend these research insights to the workplace, it means that those in privileged positions are blind to the lack of equal opportunities in getting hired, making contributions or advancing. We are also blind to inequality because it's systemic, hidden in our organizational processes and implicit norms. When we accept this, we see how pointless it is to rely on efforts to change things by communicating the facts of inequality and the business case of inclusion to the privileged. In my many years working as an inclusion and diversity professional, I have seen this approach fail, as have many of my peers in organizations around the world. When it comes to behavioural change and combatting inequality, it's like pushing water up a hill. 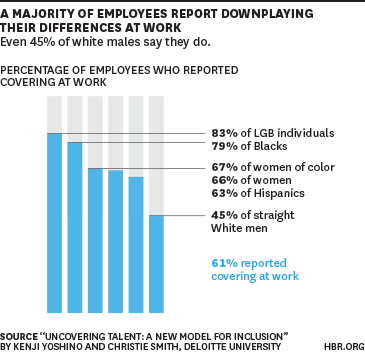 What many of us working in this field have come to realize is that a more effective way to make workplaces more inclusive is to make people feel and see inequality. It is extremely difficult to get people to change their behaviour, even when we have the right intentions and rationally understand the need to change the status quo. Our rational conscious mind gets it, but that is not the system "doing" our behaviour. In fact, while most of us recognize the value of diversity in the workplace, research shows that even employees themselves try and downplay their differences. The unconscious mind dominates about 90% of our behaviour and decision-making, and the behavioural drivers are not rationality but emotions, irrationality and instinctive responses. This is the system we need to influence. Here are some real-life examples of how to make the unconscious mind feel and see inequality, and promote inclusive behaviour. In one organization I worked with, the annual employee survey showed an increase in the numbers of employees experiencing unacceptable behaviour – think harassment, bullying, mobbing and discrimination. The leaders and employees knew the numbers, because they saw them every year. They also knew they needed to change. Instead of giving a PowerPoint presentation illustrating the data and the business case for change, I designed an intervention that would reveal inequality and trigger empathy, pain and loss-aversion bias to motivate the unconscious mind – and therefore trigger a change of behaviour. We started by collecting 40 examples where people had experienced unacceptable behaviour in the organization. We anonymized them and wrote all their stories in first person quotes. We printed them in speech bubbles, and put them up on the walls of the rooms where the exercise was taking place. We asked the leaders to walk around and read the experiences of their colleagues and employee. I remember well the first couple of times we did this with executives and the top leaders of supply chain and HR, and it still gives me the shivers. The silence was palpable. The leaders started talking about their feelings: "I feel disgusted that this is going on in our workplace." "Can this really be true?" "I feel so sad for these people." "Did he really say that to her?" "Did she really say that to him?" We know from research that social exclusion hurts physically, even when we're not directly experiencing it ourselves. Empathy is also triggered when we are faced with others experiencing this kind of treatment. Our exercise confirmed this. We also humanized the numbers. Instead of talking about 15% of employees, we wrote out how many of “your” employees and colleagues (what we call “similar others”) were affected; this helped create a feeling of social bond. And we made a reverse business case, exposing by what percentage the productivity of a team is reduced when one person is treated in this way, as well as how much the person treated like this loses in decision-making power. This helps trigger the loss-aversion bias. We are twice as miserable when we lose something as we are happy when we gain the exact same thing. We are very motivated to avoid losing something. This intervention changed the way these issues were discussed, activated local initiatives and changed individual behaviour. If I were to facilitate this intervention again, I would ask the leaders themselves to calculate how much they are losing by allowing this kind of behaviour and culture to continue. When we are actively engaged in creating the business case, we take more ownership than when it is presented to us passively on PowerPoint slides. In another multinational, the data showed that there were only a few women at the top of the organization. The head of inclusion and diversity (I&D) knew why this was: those women who were in leadership positions weren't getting enough visibility across the business and the different regions in which the multinational operated. There was also a lack of gender equality in formal and informal networks. A sponsorship programme, where executive leaders advocate for female senior leaders, was needed, but there was some resistance. The executive leaders who were to be the sponsors felt that they were already advocating equally for men and women, and that no special effort was needed for women. To make the leaders see the inequality in visibility and the need for this initiative, the head of I&D designed an intervention. At an executive team meeting, pictures of the 130+ men and women in senior leadership positions and in what the company called high-potential pools were shown on a PowerPoint slide. The executives were asked to call out the names of those they recognized. They recognized a lot of them. Then came the next slide, which faded out the male photos, leaving only the women. They were asked again to call out the names – and it turned out they knew very few. This was an eye-opener for the executives. By seeing that they knew or recognized many men and very few women, thus could not sponsor them and appoint them, they felt the need to change this. They all volunteered to be sponsors. This is much more effective than trying to convince their rational mind with data showing the exact same thing. The result was they saw the value in setting up the programme to sponsor female leaders. Within six months, two women from this programme were promoted, and talent discussions and visibility of senior female employees had improved across the business. Another way of exposing hidden biases that play out in our decision-making is through an exercise originally designed by Cook Ross, based on research by psychologist Amy Cuddy about two social perception traits – warmth and competency. Employees and leaders at all levels and in all functions would in various learning activities, performance calibration processes or talent selection processes see pictures of different people for 10 seconds and be asked to rate them based on warmth and competence. Afterwards they would see who these people are and find out what they do. The people are selected based on dominating societal stereotypes and the implicit organizational norms, and based on what they do and how they are different to the stereotypes. Most people are shocked to find how influenced by stereotypes their evaluations are. For example, based on a picture of my (warm and competent) husband, who is bald and has a beard, participants rated him low on both traits. When showed a picture of a serial killer, they rated him high on both. That's because the pictures of the two men we chose triggered associations: my husband unconsciously reminded the majority of people of a gang member or terrorist, and the serial killer looked like what we expect of an ideal leader (researchers have seen evidence of this bias across Asia, Europe and North America). Other examples: Asian-looking people were rated high on competency and low on warmth and Muslim-looking people were rated low on both (unless they look rich and educated). People were also surprised to find that these unconscious judgements activate specific feelings in the unconscious mind – such as pity, envy, disgust or admiration. While these facilitate our interactions with people, they also determine who we include and exclude, and what knowledge we include and exclude. What is clear from all three of these exercises is that we are all too often blind to the inequalities around us. But when we have our eyes opened to the reality – when we can actually see and feel inequality – that's when we can really start changing it and creating diverse, inclusive workforces. A global community of peers around the globe is sharing these kinds of interventions, which we call Inclusion Nudges. So can you. The mission is to inspire and design interventions that will make all of us see and feel equality in real life.